Morning came and one of my favorite sounds did not—the grinding of coffee beans. Friends, a bag of coffee beans would have taken a huge chunk of our $60 budget, and I would rather be uncaffeinated than hungry. Instead I found a $1.00 off coupon online, downloaded it to my Safeway card, and bought a box of 16 tea bags for $.39! Interestingly enough, I didn’t experience my normal energy crash around 2pm when I skipped the coffee. I could be onto something here. Breakfast consisted of a generous serving of oatmeal with a spoonful of peanut butter, a 1/2 cup of soymilk, and the cup of tea. For my husband and I, that totaled $1.17. 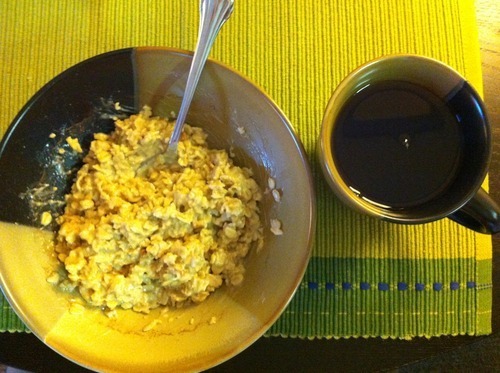 I like oatmeal and I generally find it pretty filling, so I was feeling pretty good. But by 10:30am, I was thinking about lunch. Normally I would have eaten a granola bar or a handful or granola cereal that I keep at my desk. But those Mojo bars are typically $1 a piece—not cutting it on my new budget! Then my co-worker asked if I wanted to go with her to get coffee. [Pause here to appreciate that I had given up coffee in the morning for the first time in over a year.] I explained that it wasn’t in my budget. 5 minutes later she forgot and asked again (to be polite, I know), and I reminded her of my temporary situation. I drank some water instead and kept myself busy and out of the lunchbox until 12:30pm. 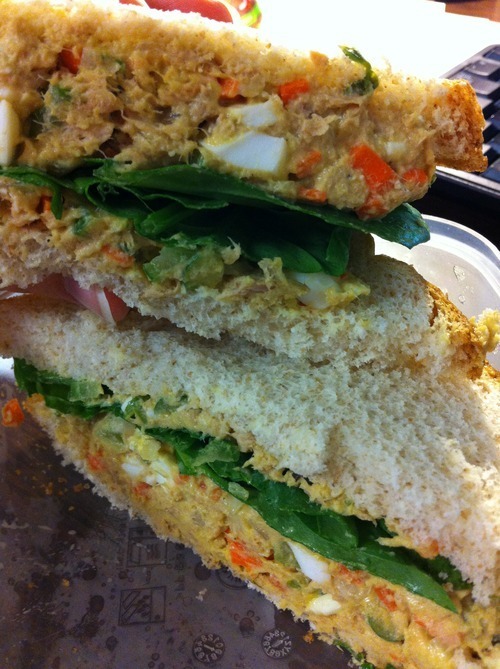 I was savoring my sandwich when I got a text from my husband: “Tuna never tasted so good.” I didn’t take offense for my past tuna recipes. I knew what he meant. But then again, knowing that my tuna fish sandwich was my only lunch option made me want anything and everything else. Soup sounded good. Or a salad from down the street. And kettle corn. When planning my week of menus I planned pretty well for the meals, but didn’t fully think through snacks. As I packed my lunch box with only a sandwich, I realized that I wouldn’t last until 5pm on just that. So I added half a carrot, half a stalk of celery, 4 cherry tomatoes, and an emergency baggie of oatmeal, cinnamon, and brown sugar. They were all gone before 5pm. As I killed my snack stash I realized again that the foods I tended to rely on for snacks are not cost effective. I tend to use granola bars, nuts, and fresh fruit for snacks, and those are hard to buy in quantity for 2 people on a SNAP budget. We managed to get 7 apples, but for the 2 of us, that wasn’t enough for daily snacking. I got home and immediately started chopping vegetables for the lentil soup that will sustain us for several days. 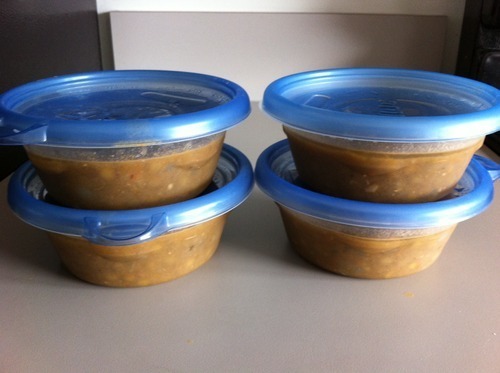 A whole bag of lentils, an onion, 2 carrots, 2 stalks of celery, a can of tomatoes, 2 bouillon cubes, and spices. Two bowls of soup, a couple slices of bread with butter and we have a meal for two for $1.68. Lessons from day 1: Snacks are more important than I realized and tea isn’t so bad. Be glad you kept condiments and spices outside the budget. They really make the difference on some of the more bland foods you’ve got to eat on a budget. Now, out of curiosity, will you be sharing any of the recipes from this experiment? They make a huge difference! The husband might have revolted once or twice without hot sauce! I will definitely share the recipes. Thank you for asking! Some of them were included in the text, sort of…but I will pull them all together. Sounds like a great weekend project!